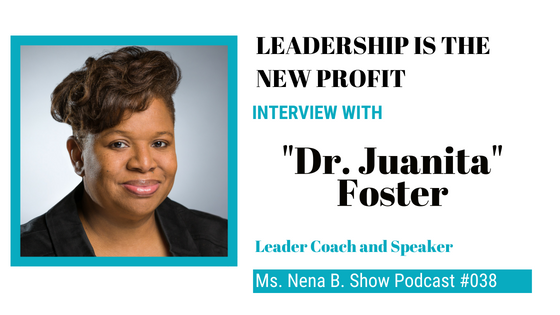 Podcast 038 – Interview with Dr. Juanita Foster – Leadership is the New Profit – Ms. Nena B. Are businesses missing the impact of bad leadership on their bottom line? Are leaders born or made… or a combination or both. How you help leaders grow? Are you are a profitable business leader? One-minute leadership quiz. “Leading is the new profit”. What is the Leadership Mirror? Listen to this insightful interview with Dr. Juanita Foster, Leadership & Team Development Expert. You can follow her on social media and connect with her on LinkedIn. Juanita is a Leadership & Team Development Expert, Speaker, Trainer, and Consultant. Her deep passion and commitment to leadership have led her to launch, Educate Motivate Elevate Consulting, LLC (EME Consulting). EME Consulting is committed to working with leaders and aspiring leaders on the nine pillars of leadership so that they show up powerfully and as a result, their organization experience increased profits. Juanita has spoken on a variety of events and engagements on leadership, team and organizational development. She is known for being informative, interactive, and engaging who equips the audience with strategies that they can immediately implement. Juanita received her Certification in Training and Staff Development in 2006, B.S. in Organizational Management in 2007 and M.A. in Organizational Leadership in 2009 from Wilmington University. She received her Ed. D in Organizational Leadership from Argosy University in 2016. She is also a member of Sigma National Honor Society. Podcast 034 - Confidence Booster Shot<< >>Google Yourself! What does your digital footprint say about you?